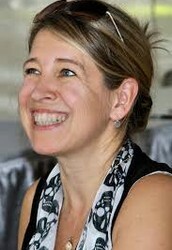 Doreen Cronin became an author in 1997 in Brooklyn, New York after her 1st grade teacher told she was an amazing writer. 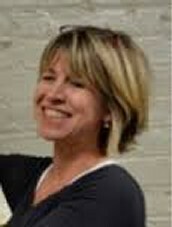 Doreen Cronin was born and grew up in Merrick, New York with 2 brothers and a sister. Doreen decided she wanted to be a writer in 1st grade after her teacher told her she was an amazing writer. After she went to college at Penn State and St John College she was actually an attorney and part time author. In 1997 her first book was published 5 years after she wrote it. In the present day she lives in Brooklyn, New York with 2 kids and loves to read in her free time. Doreen Cronin’s writing style is repetition. One reason why I think that is that in Click Clack Moo she repeats over and over about the farm animals. 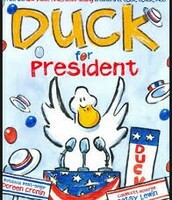 Another detail is that in Duck For President she repeats that the duck is going through elections over and over. 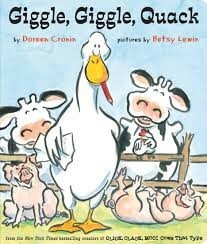 The last detail is that in Giggle Giggle Quack she repeats how the animals are getting into trouble. Doreen Cronin’s mood in her books is Joyous. One reason why I think that is that in Click Clack Moo she writes the story with a positive and funny language. 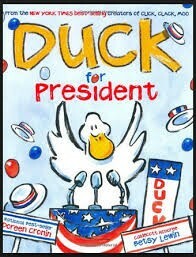 Another detail is that in Duck for president it is written with a funny attitude. The last reason is that in Giggle Giggle Quack it is book with a funny story to it and it is very joyous. "About Me." About Me. N.p., n.d. Web. 02 Mar. 2015. "Doreen Cronin's Biography | Scholastic.com." Scholastic Teachers. N.p., n.d. Web. 02 Mar. 2015. "Doreen Cronin Bio." LoveToKnow. N.p., n.d. Web. 03 Mar. 2015. "FAQ's." FAQ's. N.p., n.d. Web. 02 Mar. 2015. "Interview with Children's Writer Doreen Cronin, Part 2." Examiner.com. 02 May 2012. Web. 03 Mar. 2015. Cronin, Doreen, and Betsy Lewin. 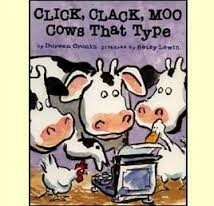 Click, Clack, Moo: Cows That Type. New York: Simon & Schuster for Young Readers, 2000. Web. 5 Mar. 2015. Cronin, Doreen, Betsy Lewin, and Dan Potash. Duck for President. New York: Simon & Schuster for Young Readers, 2004. Print.